The Bugatti La Voiture Noire ultra luxury automobile sits on display on the opening day of the 89th Geneva International Motor Show on Tuesday, March 5, 2019. Bugatti, the French sports car brand that is now owned by German automaker Volkswagen, has revealed the most expensive new car ever built. 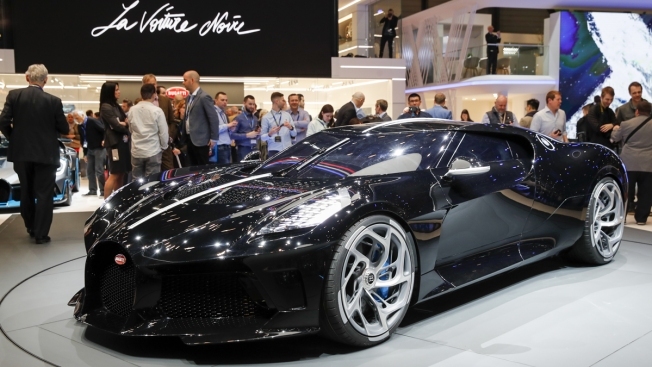 With a sale price of 16.7 million euros ($19 million), the Bugatti La Voiture Noire was publicly debuted Tuesday at the Geneva International Motor Show in Switzerland. Only one example of the model has been built and was developed to mark Bugatti’s 110th anniversary. The company said the six-tailpipe “hypercar” represents the pinnacle of Bugatti’s production line. The 8-liter engine has 16 cylinders and 1500 brake horse power. Bugatti just unveiled the most expensive new car ever built from CNBC. The new owner hasn’t been revealed but several industry reports suggest that former Volkswagen Group chairman Ferdinand Piech has added it to his collection of high-end cars. Bugatti says the car is “more than a modern interpretation” of Jean Bugatti’s Type 57 SC Atlantic, of which only four were ever made.